The women of WEALF are as diverse as the businesses they have created. Learn more about them below and click on their names to visit their company's websites. Autumn Adeigbo’s fashion company is full of vivid and intricate designs that will easily become the statement piece of any woman’s wardrobe. She launched a pilot production program in 2014 in Ghana; unemployed women were able to learn hand-beading to create intricate patterns and designs, while also raising their incomes by 91%. She has just launched her first collection 100% sourced and made in Africa. Founded by Atinuke Akinwunmi in 2011, PurH2O is dedicated to ensuring access to safe and clean water for the local community. PurH2O comes from a natural source in the Northern Pocono Mountains where it is also bottled and purified. Making water accessible has also been this company’s goal as it provides delivery services to workplaces, homes and schools. Founded by Sandy Bastien, Plumeria creates silk real touch, realistic tropical wedding flower bouquets that will outlast your day and be a keepsake forever. With Plumeria there are no “oh no,” moments only “aww yes it’s BEAUTIFUL,” when the wedding bouquet arrives. Visit the website to see all the beautiful bouquets available and learn more about Sandy, a mother of four who in her spare time, writes, speak and innovates to inspire people. 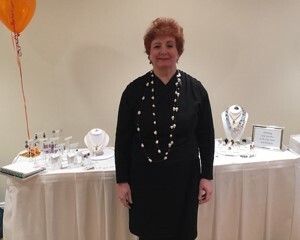 Founder Jane Becker is a professional gemologist and jewelry designer, who offers clients a unique service allowing them to redesign heirlooms and jewelry into pieces that fit their lifestyle and fashion sense. Jane is dedicated to creating personalized pieces for her clients. PaperGirl Collection, illustrated clothes, books, toys and room decor for girls, celebrates childhood curiosity, imagination and creative freedom. Founder Ana Bianchi, designs dresses for 9 months to 6/7 years old, to spark imaginations with beautiful illustrations and fun stories. Each dress comes with a mini storybook with fun facts to discover. Artwork for dresses and books are inspired by nature, art, world cultures, and timeless childhood fantasies; are translated into thematic collections. Dresses are available online and have been featured at many high-end store including Bergdorf Goodman and Neiman Marcus. Ana’s new lifestyle blog, launching December 2017, OurIllustratedLife.com reflects creative living beyond PaperGirl Collection. 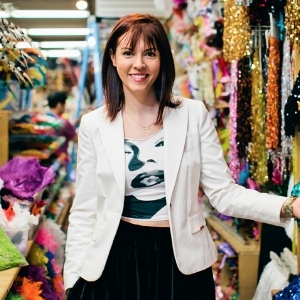 Founder Sheila Black has created NY's Favorite Hosiery & Fashion Accessories Brand. LIHA supplies hosiery to all women with curves in sizes ranging from small to queen, including 3x and 4x. Along with hosiery that you can't live without LIHA also carries jewelry, bags, scarves and hats. D.I.D. Nail Paint is a highly pigmented, eco-friendly nail color collection that complements the beautiful tone of your skin in one to two coats. Blanks, a licensed nail technician, creates a nail collection that is cruelty free (never tested on animals) and is proudly made in the United States. D.I.D. Nail Paint contains no formaldehyde, no formaldehyde resin, no toluene, no dibutyl phthalate and no camphor. Denton Cleaning provides expert house cleaning and maid services, ranging from bi-weekly residential and office cleaning to post-construction clean up, throughout the five boroughs and in several other locations. Every employee is well-trained in the usage of biodegradable cleaning products that help the environment. Po Campo is for people who love using their bike to get around and refuse to sacrifice functionality or style. Chicago industrial designer Maria Boustead created the line in 2009 when she realized that she needed a bag that was easy enough to attach to her bike and stylish enough to take into her office. Po Campo has been featured in The New York Times, Chicago Tribune, Elle, Teen Vogue, and Yoga Journal. HAVYN® Skincare & Spa, manufacturer of organic beauty care products was founded by licensed esthetician Nikki Carrington in 2011 to formulate and manufacture bar soaps, cleansers, astringents, lotions, oils, and other beauty products for her clients skin. Whether clients have sensitive skin, are cancer survivors, or prefer non-synthetic products, this line was created to heal and restore skin on a consistent and effective basis. Nikki Carrington is a certified New York M/WBE vendor and a member of the Brooklyn Chamber of Commerce. MILAGROS CARBAJAL: M&M 24 HOUR DAYCARE INC. Founded in 2016 by Milagros Carbajal, M & M 24HR Daycare Inc. is a licensed at home daycare that offers extended hours. The company’s mission is to provide a safe, clean and educational environment to children. All staff is CPR certified. It is a privately held company located in Bronx, New York. Founded in 2013 by fashion enthusiast, Aliza Carter, THE CANDY SHOP is a whimsical casual boutique of clothing and hair extensions for women who appreciate standing out. Aliza works diligently with manufacturers to provide an amazing shopping experience for everyone. Chatman J Cakes is artisanal bakery in the Bronx, New York that specializes in a limited collection of hand-crafted, award-winning cakes and pies with a Southern influence. Founder and baker, Jean Chatman makes all of her dessert creations with natural and locally sourced ingredients. From her award-winning Zucchini Bread to her Sweet Potato Pie, every order is made with precision and care to fit the client’s needs. Founded in 2011, Fancy Pies is a seasonal pop up shop in Washington Heights selling home-style dessert pies with high quality locally sourced produce in a signature all-butter crust. 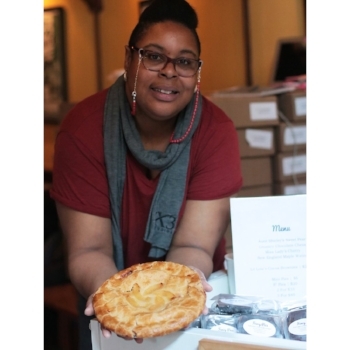 Inspired by her neighbor’s kind gesture during a time of mourning, Coleman was motivated to create her own business by providing home-style pies just like her mom’s. Fancy Pies offers a variety of pies such as: Aunt Ann’s Tangy Citrus Meringue, Bessie’s Boozie Butterscotch, Dave’s Mixed Up Berry, and Mama’s Dutch Apple! Diane Da Costa's SimpleeBEAUTIFUL is a full service hair salon and luxury product retailer. 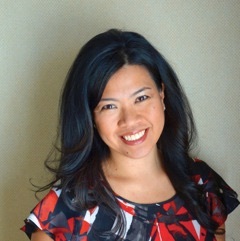 Diane currently operates a salon in White Plains and looks to expand in Harlem. Diane's philosophy is simply - Textured Hair is Gorgeous Hair! Whether straight, wavy, curly, or coiled, the salon looks to restore all hair textures to its ultimate healthy nature. The Little Hot Dog Wagon is a mobile food wagon servicing New York City and New Jersey communities with its special Homemade Kraut. This special recipe offers farm to table freshness, careful preparation and selection of organic and natural seasonings. It works as a zesty, refreshing appetizer or side dish with meals; or it can be used as an amazing flavor enhancer topping for hot dogs, sausages, tacos, burgers, steaks, chops, cutlets, grilled chicken, seafood and more! Influenced and inspired by her Morrocan heritage, Nadira El Khang, handcrafts each bag made in her collection from leather. After moving to the U.S. in 2009, Nadira founded her business while studying accounting. All Nadira bags feature stylish designs and premium leather. Oweyaa, is a social impact company that helps veterans and military spouses build better civilian careers through project-based internships with fast paced startup companies. Oweyaa takes the matching process one step further, matching the candidate not to a company, but to a project. Through this project, the company is able to remain productive while learning more about the candidate and helping him/her grow and develop their own skill sets. Betina Estela founded Cake Heights in 2012 combining varieties of delicious flavors in artistic and beautiful cakes for all occasions. A graduate of Le Cordon Bleu baking and patisserie in 2007, Betina went on to growing her skills as a pastry chef at a popular New York City tea-house. A Nu START NY, Inc. offers personal, professional and caring service to assist older adults and their families with relocating, downsizing and/or modifying their home environment. Founder Barbara Feldman created a business with a staff dedicated to ensuring that seniors have a stress-free moving process. Founders and friends, Jennifer Fiore and Nina Lalli, met in a Monday night pottery class in Brooklyn, and worked together to build a business crafting unique, handmade pottery. Each MONDAYS piece is handmade in Brooklyn with no two exactly identical. Mondays supplies dishes for 4-star restaurants like Blue Hill at Stone Barns, Tygershark, and Jema. Their full line of products is available on their website and select designer boutiques in New York and California. Since 2010, Fabulous Freddy’s Beauty Supply Boutique has been providing knowledge, advice and top-ranked ethnic hair and skin products to customers in the Queens, New York community. Founder Janice Fredericks, created a business that is not simply a brick-n-mortar beauty location, it’s a place that serves women from various backgrounds, with diverse lives, with their daily dose of beauty. Megan Hartman-Sparks was a new mom fed up with what she has called “the lack of transparency in the cosmetic industry.” Leery of harsh chemicals in everyday personal-care products and determined to offer her young son, now 17-month-old Charles, “chemical-free snuggle sessions,” she decided to take action. The result is Lymph Candy, a Brooklyn-based deodorant line focused on bringing a nontoxic product to the global marketplace. Formulated to be highly effective with just six ingredients, Lymph Candy is also designed to promote lymphatic health. an Olympic-styled youth gymnastics training facility in New Jersey. The academy began as a child care playroom over a decade ago, and has grown into a vehicle for local gymnasts ages 5 and up to learn gymnastics with hundreds of young people participating over the years. The academy’s goal is to impact the health and well-being of the communities by building leadership qualities within gymnasts and instilling a strong desire for healthy living and self-determination; including young athletes seeing themselves as future business persons. Mariya Kelly founded her brand with a vision to bring the fashion industry more balance through conscious design, sustainable processes, and authenticity through diversity. The brand creates wearable art and temple adornments for sacred women; women who believe they must dress consciously and be mindful of the colors they choose to wear for they know colors ultimately keep us balanced. PULSE is a natural foods company committed to creating tasty snacks providing the goodness that your body needs and satisfying the flavors your body craves. The company offers handmade small-batch roasted chickpea snacks that are vegan friendly and free from common allergens. Natalia, designers and creator, founded Le'Bulga in 2003 The Brand is known for lamba leather bags and eye-catching designs inspired by New York City’s fast paced lifestyle and geared toward the modern woman’s life journey. Le’Bulga's classic designs and impeccable quality are aimed to withstand the test of time. Brooklyn Piggies™ puts the perfect pig in a blanket! In 2012, Missy Koo and Stacy Cole tackled a simple goal: take America’s favorite hors d'oeuvre and make it better! They worked with a top tier sausage purveyor and developed a variety of Piggies parallel to none. Their Piggies found immediate success, drawing lines at outdoor food fairs. Soon after, Brooklyn Piggies™ gained the attention of Oprah Winfrey, landing a feature on the O’s Favorite Things List. Brooklyn Piggies™ continues to thrive – from arena settings to intimate cocktail parties nationwide. Kingsway Medispa & Wellness Center LLC is a luxurious spa where clients experience result-oriented, state of the art treatments with an ambiance of relaxation and southern hospitality. Kingsway offers an array of skin, hair, and body care treatments that vary from holistic to medical, advanced to non-invasive therapies and performed by highly qualified practitioners. Located in the heart of Midwood, Brooklyn, its expert staff supports clients make beauty decisions that promote health and well-being. Gingie McLeod is the founder of SAINT CHIC. a unisex fashion and lifestyle brand. SAINIT ChiC created the viral sensation, The Paparazzi Visor™, the best sun protection on the planet. SAINT CHIC is available on several e-commerce platforms including its own. Tineta Newton created EyeCycle™ due to lack of variety and culture options within the fitness industry. Its branded total body fitness format is exclusive, encompassing choreography, upper-body toning and constant mental and physical enhancing techniques. Tineta began her career in 2003 as a Group Exercise Manager for Bally Total Fitness, leading 3 Bronx clubs to #1 while managing. Her first spinning studio is open for business at 866 Hunts Point Avenue in the Bronx. Founder Kerri Quigley created The Fashion Class to offer creative classes for children and teens after school and on weekends throughout the school year. Utilizing The Fashion Class, unique project based curriculum, children learn to sew and design real fashion from professional instructors who are all graduates of art and design programs and work in the fashion industry, designers, costume designers and fashion illustrators. Honeydew Drop has served the Brooklyn community since 1999, caring for children from ages 4 months to 5 years old. Honeydew Drop’s mission is to provide high quality childcare, parental support and leadership training for childcare providers. The focus is the socio-emotional health and growth of the children, their families and their caregivers. Fabiola believes that teaching young children to become independent and part of a community is as important as teaching them ABC and 123. Sustainable Snacks, founded and owned by Rebecca Scott, is a natural foods company committed to producing nutritional snacks. Founded in 2013, Sustainable Snacks is known for its plant-based ingredients and outstanding initiative to support communities and the environment. Rebecca strives to promote public health through better snacking without compromising on flavor and taste. Spadét, manufacturer of olive oil beauty care products, was founded by biochemist Annabelle Santos in 2008 to manufacture the creams and soaps she developed to treat her daughter’s dry, irritated and itchy skin. Over the next 6 years Annabelle expanded the line to products that treat other skin and hair concerns. Annabelle is a certiﬁed M/WBE vendor to New York City and New York State, and is one of the winners of the prestigious American Entrepreneurship Award for 2017. Principal and Designer, Erica Simon named her jewelry design business after her namesake and grandfather Robbie Taub. Erica learned jewelry making from her grandfather, a dentist, who crafted beautiful jewelry, charms and trinkets using the scrap gold from his office. Erica's designs are detail-oriented and challenge common combinations of medium and form; drawing inspiration from different cultures and eras, Erica crosses different takes on beauty-- intensifying the impact in a way that a unilateral approach couldn't achieve. Jessica Spaulding a lifelong Harlem resident and, Founder & Head Chocolatier of the Harlem Chocolate Factory. Jessica founded her company with the goal of sharing the rich and diverse history of Harlem using chocolate. Working with chocolate since and attending chocolate shows with her mother since the age of 9, Jessica converted her hobby into a business in 2015 after winning the Grand Prize in the New York Public Library's NYStartUp! business plan competition. Starting in a local food business incubator kitchen, the Chocolate factory’s grown to owning a storefront and production kitchen in the historic Strivers' Row section of Harlem. All products are handcrafted on-site using fresh, local ingredients. Jessica takes pride in representing Harlem and starting a legacy that will make life much sweeter. Move with Grace Moon Studio, as it’s affectionately called, began as a DIY studio offering daily classes, such as yoga, Pilates, fitness, belly dance, West African, Zimbabwean, Brazilian samba, salsa dance styles, and martial arts. In addition, the studio provids the community with a much-needed rental space for instructors and workshops. Grace encourages the community to keep active and promotes healthy diet options at her Juice Bar. 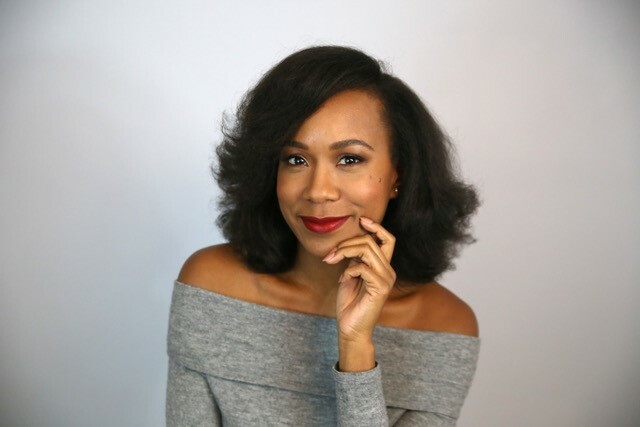 Founder and CEO of Karen's Body Beautiful, Karen Tappin has transformed her natural hair and skin care line from a modest home-based business into a blossoming enterprise. Alarmed by the presence of carcinogenic ingredients in many bath and body products, she researched the cosmetic and therapeutic properties of natural ingredients and developed recipes for a full hair, body and bath line. LAURA TORRES: CITY DOG CO.
City Dog Company, makers of the City Gypsy Wristlet Pet Carrier; the patented pet carrier, made of 100% organic cotton. This carrier makes it easier to move around the city with your fur baby, and folds up into a convenient clutch bag for carrying on the go. Available in small and medium sizes; and with 10% of all sales going to local animal welfare & rescue groups, this is the perfect accessory for people with dogs up to 20lbs. When your dog is family… makes premium, nutritious treats for dogs using organic ingredients. Founder, Karen J. van Ingen began preparing food and treats for her dog, Lola, when she discovered that what was available commercially were filled with additives, chemicals and fillers. Kalo Karma's product line is tasty for all pups and includes hypoallergenic treats and treats for pups watching their weight. Flavors include Peanut Butter Bliss, Cheese Please! and Karma Puffs. Karen says: Dogs think they’re ‘delish, you know they’re healthy! Ashley Warmington founded Cozy Oasis 10 years ago to provide hospitality services to people renting out their homes through Airbnb agents. Cozy Oasis personally handles the essentials like check-in, check-out, cleaning and linens, and is there to answer any questions guests may have, keep them up to date on the best events happening throughout their stay, and tend to any emergencies that might arise. The company partners with other high end companies and services, including WEALF sponsored Spadét, to provide guests the most luxurious stay possible. 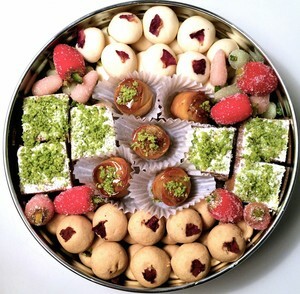 Popilee Patisserie specializes in authentic handmade Persian sweets, made with the finest organic and traditional ingredients. Today, Roshanak's pastries fill the "sofreh-aghd" of Manhattan weddings as well as the dessert tables of private events throughout her city. Popilee continues to expand, now catering all-things Persian; their appetizers have recently adorned the dinner tables of events throughout New York, including the annual Noruz at the Met gala held at the Temple of Dendur.